Ten thousand librarian-types are descending on downtown San Diego this week as the American Library Association comes to the Convention Center for their Midwinter Meeting. A few weeks ago, this sort of news wouldn’t have interested me at all. After all, what can they be doing? Chatting up the Dewey Decimal System? Seminars on advanced Shushing? Like most conventions, the ALA confab is a mixture of commerce (several hundred exhibitors), networking opportunities and committee meetings, along with the mandatory book signings and celebrity shout outs. This year’s guest star is actor Ted Danson-plugging a forthcoming book on Oceanic environmentalism. And they’ll all be a buzzin’ about the new posters promoting reading that feature the cast the hit TV series “Glee”. But dig a little deeper and you might be surprised at what’s going on in library-land. On one of my weekly library runs—I don’t watch much TV—I happened to pick up a copy of This Book is Overdue! 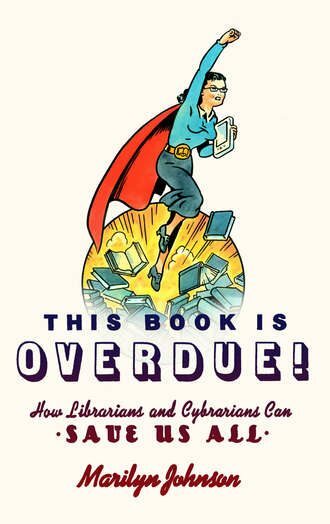 How Librarians and Cybrarians Can Save Us All . Penned by Marilyn Johnson, the volume explores the inner workings of libraries and, more interestingly, the real and virtual lives world of librarians. Although Overdue! takes us on a very brief tour, the revelations about the many activities of the more innovative librarian-types is a real eye-opener. Librarians as steampunkers! Librarians in the vanguard of the fight for civil liberties, a fight that goes way beyond the banned books week at the beginning of October every year. Blogger librarians with an attitude! And a whole virtual reality world of libraries with links to both real and virtual collections staffed by avatars that exist only in Second Life who may (or may not) wear clothes and may (or may not( spout X-Rated text. The point of the Overdue! is that the profession that many characterize as being quiet gatekeepers of moldy card catalogues has taken on the “madly multiplying beast of exploding information and information delivery systems” in a way that Google, with its algorithms and formulas can never hope to match. They’re humans. Humans operating under the premises of truth, free speech and universal literacy that want to help us find what we need. Google says, “Do No Evil”. Librarians say, “Do for the Public Good”. In tough economic times, with libraries sliding farther and farther down the list of priorities, we risk the loss of their ideals, intelligence and knowledge, not to mention their commitment to free access for all—librarians consider free access to information the foundation of democracy, and they’re right. Librarians are essential players in the information revolution because the level that field. They enable those without money or education to read and learn the same things as the billionaire and the Ph.D… They are the little “d” democrats of the computer age who keep the rest of us wired… In tough times, a librarian is a terrible thing to waste. The library world, even for a dedicated library-holic like myself is much larger and complex than I could have ever imagined. So I say, if you see any of these folks hanging around town for the convention this weekend, give ‘em a thumbs up. And I’ve got to get going here, because my copy of Overdue! really is overdue! They’ve got my thumbs up and a big hug!